We recently had the pleasure of being interviewed by the Division of Diversity and Community Engagement at The University of Texas at Austin. 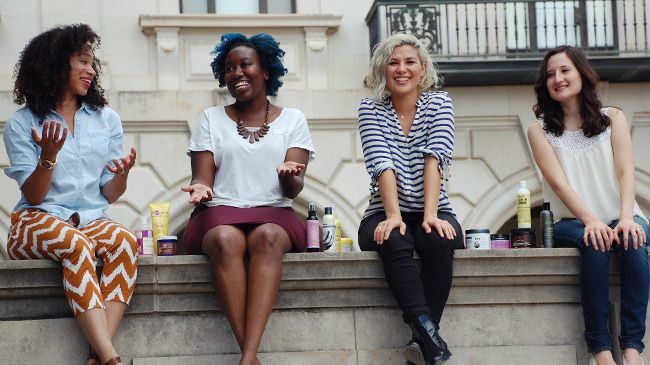 We talked about our experiences on and off campus that informed our career choices and ultimately landed us here at NaturallyCurly. Here is the full interview, written by Virginia A. Cumberbatch. Hair care isn’t exactly the industry that most imagine when envisioning platforms to drive the diversity and inclusion conversation or to enact social change, but for four University of Texas at Austin (UT) alumnae, their individual expertise and passions have come together to drive forward important dialogue, where inclusion and cultural acceptance is at the center through the online platform, NaturallyCurly.com. 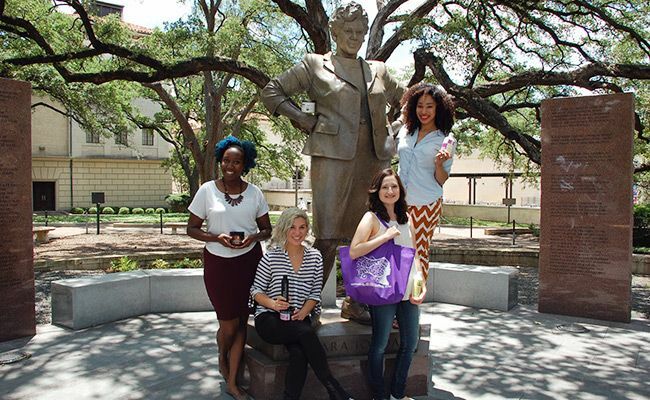 Nikki Green (09), Cristina Cleveland (08), Evelyn Ngugi (11) and Susonnah Barklow (11) each came to UT looking for a unique experience. Nikki, a communications major, desired a campus where she could get a great education in the state of Texas, whereas Cristina, who studied advertising, transferred her sophomore year from a prominent private Texas institution, believing that UT’s large international population could provide the cultural diversity she was missing in her college experience prior. “I couldn’t imagine graduating in four years and only knowing one type of person, I wanted an environment that offered people with different life experiences and perspectives.” Having grown up in Brownsville, Texas, Susonnah thought UT offered a refreshing opportunity to explore life outside of her Latina roots, “I was just amazed by all the languages I heard every day walking around campus. I grew up in a majority Hispanic community and I appreciated getting to know people from different backgrounds.” Dallas-Fort Worth native Evelyn, who majored in journalism, gravitated to UT for the big university experience, providing just enough people and things to do that she could challenge herself to try new things and meet new people. It was at The University of Texas that these alums discovered their interest in observing social patterns and cultural dynamics. As women of color, they were each uniquely challenged and groomed to take on tough conversations about identity, access, space and place on campus and in the larger world. For Cristina such social politics were defined by space, “there was always a feeling that I didn’t belong in West campus, I didn’t understand being a part of such a homogenous world, everyone dressed the same way, everyone straightened their hair. It was strange and uncomfortable.” Nikki’s interaction with the diversity conversation started in the classroom. An active member of the Black Student Alliance, Nikki felt that student organizations like the BSA were essential to providing African American students with a platform to explore their shared experience; likewise, the organization served as an invaluable resource for many African American students who felt isolated on campus. “I recall that the only time I wasn’t one of the only African American students in my class in the comm school was when I ventured outside the department to take Africana Studies courses. It was there that I felt like I got to study myself and feel a certain connection with classmates and professors.” These types of experiences translated to life outside the classroom as well, and although at the time only prompted personal reflection, ultimately in partnership with their fields of study and academic interests would guide their professional pursuits. Although Cristina, Nikki, Evelyn and Susonnah all landed jobs in their respective fields after graduating, not one of them felt truly connected to their work. That desire to fuse their intrinsic cultural understandings with their work in communications, journalism, and advertisement attracted them to the work of NaturallyCurly. A “dynamic social platform that empowers and engages a multicultural community of female influencers – the largest in the world of haircare,” the brand offered each Longhorn something they didn’t think was possible, the ability to empower, educate and evangelize in their 9 to 5 life. For these four UT alumnae NaturallyCurly’s motto, “where curls come to life,” is also where understanding and power come to life for many. They believe NaturallyCurly helps women, particularly women of color form new appreciation and admiration for their natural locks and therefore self. Nikki, who serves as Naturally Curly’s email marketing manager recalls her own hair journey of self-discovery being challenged while at UT. “I always felt that I needed to straighten my hair or wear weaves to be considered approachable, trendy and most importantly professional. There are so many women of color who have been told their natural hair, whether it’s big curls, fros or braids is not acceptable in the work place or professional looking…that’s like saying who you are naturally isn’t acceptable.” This conversation of social acceptance has driven much of the work of NaturallyCurly and continues to dominate the online community space. The Division of Diversity and Community Engagement at The University of Texas at Austin is a successful model for integrating diversity into the core mission of a university and integrating community engagement into teaching, research and service. As well, DDCE strives to connect the university’s intellectual resources to communities across Texas and offer education to those who may face the greatest challenges in accessing it. The DDCE works with a broad range of student, faculty, staff and community constituents to help make The University of Texas at Austin a national model for diversity in higher education. Writer Virginia A. Cumberbatch is the marketing manager for the University of Texas at Austin’s Division of Diversity and Community Engagement in Austin, Texas. She’s written articles for Politic365, GivingCity Austin Magazine, Clutch Magazine and has been featured in Tribeza and the Austin American-Statesman. In 2014 she was awarded the Greater Austin Black Chamber of Commerce Emerging Leader Award. Follow her on Twitter @vacumberbatch.